How to Market your Business to Millions of people on Whatsapp Using TribeMaster Platinum. Do you know how I grew my Forum - Wakanda.ng to one of the top 10 online forums in Nigeria with over 72,000 members in less than a year? It's Largerly through Whatsapp Marketing and I will be revealing a vital tool to enable you effectively promote your business on Whatsapp for FREE! You see, Whatsapp has over 1.5 Billion monthly Users. Its personalized and direct messaging nature drives up opening rates and consequent high conversion for marketers. When was the last time you ignored your whatsapp messages? I guess you can't remember because most people, like you and I, open whatsapp messages everyday. It is this addictiveness and directness that makes whatsapp marketing to targeted audience very effective. In this age, attention is the new money and that's why Coca-cola, despite being a popular brand, still spends Billions of Naira in advertisement every year! You can't get new customers for your business if you can't get people's attention and no attention means no sustainable inflow which is terrible for any business. The question now is how do you acquire new clients, make sales and at what cost per lead? Whatsapp Tribemaster presents the most direct and effective way of reaching your target market at NO COST. Yes, Whatsapp Tribemaster will help you send bulk messages to millions of people on whatsapp for FREE and this can be repeated countless times still at NO COST. This is what I have been using for my marketing since 2018 and it has saved me over N900,000 in marketing cost. Are you Surprised? 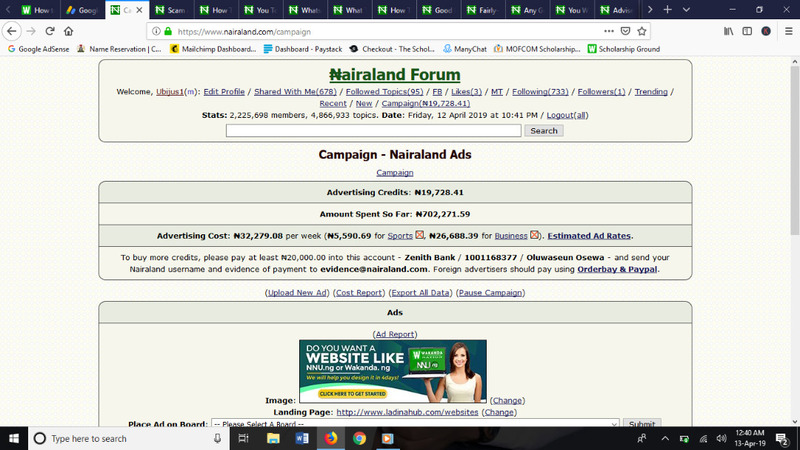 The Image below shows that I have spent over N702,000 on nairaland.com Adverts alone - A platform I don't even run adverts regularly. So when I say the software has saved me over N900,000, I am actually under-estimating. No matter your budget, the software is FREE to use and will save you a lot of money while delivering great results! It sends bulk messages to any list of whatsapp numbers for free. This can be done repeatedly still for free. It generates 200,000 Phone numbers in 1 minute! Once Installed and activated in your system, the software has no expiration or Limitations. I have been using mine for over 8 months now. You can customize messages inside the software to suit your taste. You can also customize sender Name and Images. It filters your list of numbers to remove fake and wrong phone numbers. You can sell the Software to people and make money! How would you feel if you had the opportunity of sending promotional messages regarding your business to 200,000 Nigerians at one click right now for FREE? Would it move your business forward? Would it add value as you do it repeatedly still for FREE? That's why Whatsapp TribeMaster Software is Ideal for your marketing. It helps you remove the cost of marketing while delivering great results! This software is relatively new and, with a small token, you can have it today for your marketing or to re-sell it to others! Yes, the Software is premium and can easily save you cost and deliver effective marketing. I bought mine at N30,000 last year and it has saved me over N900,000 in marketing cost. Today, you have the rare privilige of getting Whatsapp Tribemaster Software for just N5000 only! This is my friendship Gift to you and it is for first 20 people to make payment! After 20 buyers, it will go back to the original price of N30,000 and of course it is still worth more than that amount. Union Bank - 0040704639 - Remedy Nwankwo. After payment, Text or Whatsapp your email address to +2348152054014 and your Full package will be sent to your email immediately. You know what is very sweet about this offer??? I will give you a list of over 76,000 phone numbers I use for my marketing for FREE. I usually sell this list for N15,000 but I will give it to the first 20 people to make payment for free. I will also add a demo video explaining how to use the software. This is to make things as easy as possible for you! If you purchase the software Today, I will give you another software that generates the Whatsapp Tribemaster activation keys! This means you can make Money by selling the software to other people and generating their activation keys! Good Marketing is the secret of new customer acquisation and profit acceleration in business. This software presents a rare opportunity to effectively market whatever you do to thousands of people for FREE and you shouldn't miss it! You can either make money using this software or selling it to people who need it for effective marketing. You can get this software for N5000 right now OR pay N30,000 later to get it once 20 people buy it before you, the choice is yours! Transfer N5000 only to: Union Bank - 0040704639 - Remedy Nwankwo. Text or Whatsapp your email address to +2348152054014 and your full package will be sent to your email. Hmn! Nice idea for marketing. But how do you tend to use the software to achieve positive results?as I know people hate and do frown on spam messages and they don't waist time to block and report. What tips do you have to tackle that? Yes, I am aware of the possibility of that. I also know how to avoid it and that's the benefit of experience which I usually pass down to buyers of the software. So, I don't just deliver the software, I guide on how to use it effectively! I look forward to helping you achieve your marketing goals through the instrumentality of effective whatsapp marketing! Yes, the software works perfectly as explained above. If it weren't so, Wakanda.ng and its management wouldn't be involved in marketing it! So, you can order your copy of the software right now by paying 5k to the account above!